A collection of recipes from Cosgrove residents past and present. 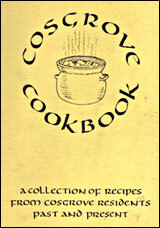 This cookery book has been compiled from contributions sent in by residents and ex-residents of Cosgrove. Thank you very much to all of you who gave us recipes. The proceeds from sales will go towards the new Village Hall. The culinary art is as important as any of the other arts - and a more consistent bringer of pleasure. Click on a section and then SCROLL DOWN to see all the recipes. Select some sound hearts. Be careful not to bruise them with unfeeling words. Take the milk of human kindness, one heartful, add plenty of tact. Warm the mixture with sympathy but do not let it get too hot at first, else it will only ferment mischief. Knead it with plenty of the oil of unselfishness to make smooth. Beware of jars. The mixture should be kept in a warm corner of the heart. Years will only serve to improve the flavour of friends thus preserved.